Lets say your opening is 10” wide by 20” tall. If I wanted to put 1 door on this opening we would take 10” and add 3/4” to the left and 3/4” to the right. This gets us an 11 1/2” wide cabinet door. You would do the same with the height as well. Take the 20” opening height and add 3/4” to the bottom, and 3/4” to the top. This gets us a 21 1/2” tall cabinet door. Thus, you will need to order a door with a width of 11 1/2” wide by 21 1/2” tall for this single opening. If you have an opening with a pair of doors to be installed, it is actually very easy to calculate. Say you have an opening of 20” wide by 30” tall. To calculate the width of each door you would take the opening width of 20” and divide by 2 (two doors). This gets us 10”. Then simply add 3/4” to the width to account for the overlay of the cabinet door which gets us 10 3/4”. The width of each cabinet door you need to order will be 10 3/4” wide. 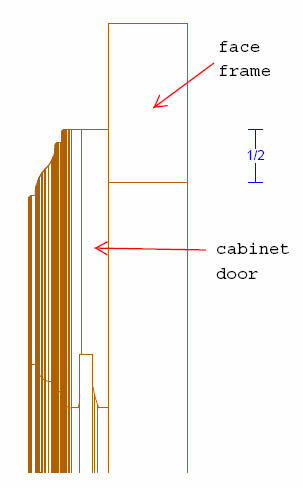 The height of the cabinet door is calculated the same as it would be on a single door opening. Take the opening height of 30” and simply add 3/4" to the top, and another 3/4" to the bottom to get 31 1/2” for the cabinet door height. To clarify, for this opening, you will need to order 2 doors at 10 3/4” wide by 31 1/2” tall.